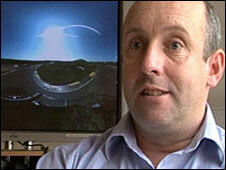 Gamers could be joining in a real televised sporting event from their homes early in 2010. Real Time Race has been developing a system that places players side-by-side with the drivers in real races. The firm's technology would map the circuit just before the race so the virtual track would match up to the one on TV. The video recording of the track would then be manipulated by the gamer during live coverage. This data would then be streamed to the player's computer or straight to a television via the internet. "We can put you in your own car, within real TV coverage of a real race, and in real time against the professionals," said Chris Leigh, the company's head. "When Jenson Button nails his car from the front you can go and chase after him and try and beat him to the first corner," he said. 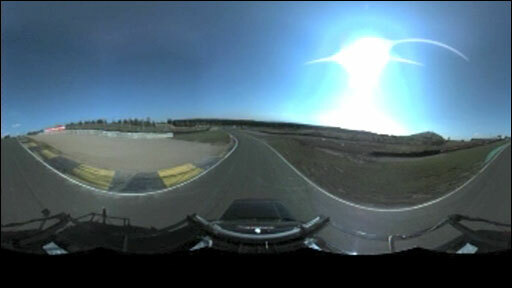 To make this possible, ahead of the race, a car with a mounted five headed-camera would need to do a lap to film a 360 degree picture of each part of the track. Unlike current video manipulation, which rotates the picture, this system allows users to move to places where the camera has not been but still offer a video footage experience. 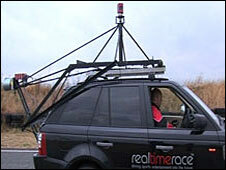 Roderick Kennedy, the technical officer at Real Time Race, said this gave drivers an immersive driving experience. "Our data gathering system can generate an image from anywhere on the track so you can drive freely around the track." GPS sensors help pinpoint a car's position to within a few centimetres, while a rotating drum fires off 64 lasers. The returning light tells the system the distance to objects. It works like a radar, except this system can map 1.3 million points a second and produce a high-resolution 3D model which the video is "mapped" on to. Software compiles all this information to recreate the racing environment, including details such as photo-realistic curves that glint in the sun. Mark Wilkin, the F1 Editor at the BBC, says audiences are becoming more demanding in the level of sophistication they expect in interactive TV. "They kind of get CGI [computer generated-imagery] - they've seen it, they've done it, and it's no longer interesting," he said. "It needs to be real, it needs to look real." He believes that if future games are to be based on actual races, games companies will need to get the interaction right. "When you bump into Alonso, he's not really going to go flying off the track, so how are they going to do that? That will be interesting to see." Compromises may be needed to fit in with the live coverage, but players could benefit from live television commentary with tailored recorded notes to cover their own progress. 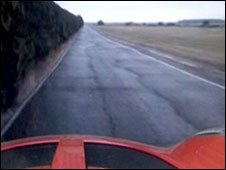 Also, if the weather changes on television this could be reflected in the racing game. Gamers would download the circuits ahead of time to their PCs or TVs to keep the constant data stream required to a minimum. During the race, just each car's co-ordinates and orientation would be constantly updated. The system's makers hope it will be usable across different sports too such as skiing, cycling, and sailing. The "rules of engagement" for drivers are yet to be finalised, the software finessed, and integrated into a real sport. Sports rights will need to be agreed, and TV companies approached. But the company says it is making fast progress on all of these issues. After four years of research, Mr Leigh expects the technology will be ready to take on a real motor sport series next year. But keen gamers can download a demo for now. Watch Click on BBC News Channel, Saturday 31 October at 11.30 (GMT).